In order to determine the best course of treatment, an accurate diagnosis is imperative. Consult with Dr. Dunn or Dr. 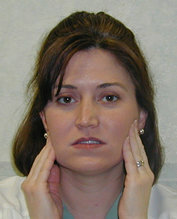 Bowling to determine if you are suffering from TMJ Syndrome. Many times all that's needed is a simple adjustment to your bite (the way your teeth come together), or a small mouthpiece that corrects the way your jaw joint closes.